The new Blackberry Z10 and one would realize that the new Blackberry 10 OS has got a refreshing change from other mobile phones. It is different from the screens of icons which are commonly found in most of the mobile platforms. 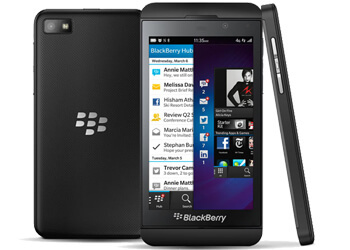 The BlackBerry Z10 has got simple design which one would find in all the phones of Blackberry. The Blackberry Z10 SIM Free is a nicely balanced device. It is neither too heavy nor too light. But still it doesn’t feel too good by holding it. However, if you compare it with iPhone 5 then you will notice that the latter is lighter than the Z10. The hardware of this smart phone is sturdy, which means, if you are using the phone even without a case and you drop the phone by chance, the phone will not break and would not get scratches. But that doesn’t mean your phone will never get scratches if it falls down frequently. The BlackBerry Z10 has got 4.2 inch screen with 1280 x 768 resolutions having the pixel density of 356 ppi. The phone has even got the HDMI and Micro-USB connections. Also, the resolution of this phone is powerful enough and it looks all the more fabulous it is connected to a TV with its HDMI connection. The phone has got 8 megapixel auto-focus rears camera with which you can record the HD video of 1080p and a 2 megapixel front camera having fixed – focus. Also, the camera of this phone has got an amazing feature, which is, Time Shift, which would allow shifting the time of the snap so that you can get the perfect shot of your snap. The quality of the video is good enough, however it is the inability of editing of the videos with it is what one can set it apart. One of the amazing changes that the BlackBerry Z10 has got is the new OS, Blackberry 10. Its User Interface is designed in such a way that the phone can be operated by touch and with some gestures. However, lots of apps have not been designed specifically for Blackberry 10. It is easy to swipe in the phone from the edge of its phone to move around the OS. But it doesn’t add anything or something very unique that would compel you to buy this phone. Of course, this phone is not that bad to use, but the people who are using the Blackberry for a really very long time then they would probably like this BlackBerry Z10 phone a lot. This guest article has been composed by Christy Root who works for PrePayMania and, who writes Guest Articles, Press Releases for Mobile Phones like Samsung Galaxy S3 SIM Free. She loves to update herself with different mobile technologies. Hi Christy! This review is very interesting. I’m not a great fan of Blackberry but I think their smartphones can compete with other popular smartphone like Samsung and iPhone. They just need one great innovation to supersede other companies. Thanks for your views Ronaldo. Yes this blackberry device can compete with samsung and iPhone. I was really into the BB Z10 and this is the perfect review. Thanks Amal for liking the post.